The Canon imageRUNNER ADVANCE 8500 Series is an intuitive, high performance solution for enterprise-level offices and central reprographics departments (CRDs). This black-and-white multifunction printer can be your organization's essential device for streamlining overall workflow efficiency and helping to improve productivity in a high-volume workplace. Built on the core values of Canon's Third Generation imageRUNNER ADVANCE platform,* the imageRUNNER ADVANCE 8500 Series operates on intelligent information management principles. Designed for high volume offices and CRDs, the imageRUNNER ADVANCE 8595i multifunction printer is capable of meeting diverse needs, with high quality output and precision staple/booklet finishing options. Serving high-volume offices and in-plants, the 8500 Series is designed to not only meet the needs of dedicated operators but it can also serve busy multi-user environments, with an intuitive user interface. Together these benefits can improve uptime and help facilitate business continuity. * Canon's Third Generation imageRUNNER ADVANCE core values include Workflow Efficiency, Cost Management, Security, Device and Fleet Management Efficiency, Quality and Reliability, and Sustainability. The Canon imageRUNNER ADVANCE 6500 Series can be the frontline to your digital business communications, exhibiting enterprise-class performance. This black-and-white multifunction printer can be instrumental in meeting today's demand for integrated imaging, cloud, and mobile solutions. 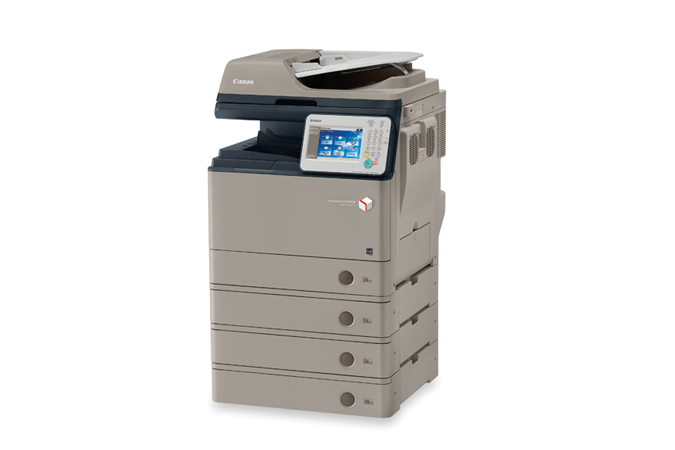 Built on Canon's Third Generation imageRUNNER ADVANCE core values,* the imageRNNER ADVANCE 6500 Series operates on intelligent information management principles. The imageRUNNER ADVANCE 6575i multifunction printer is designed to meet your most diverse and complex printing and scanning challenges for maximized uptime, intuitive usability, advanced authentication capabilities, amazing speed, and large page volumes. The imageRUNNER ADVANCE 400iF models are Canon's most advanced letter/legal sized MFPs ever. 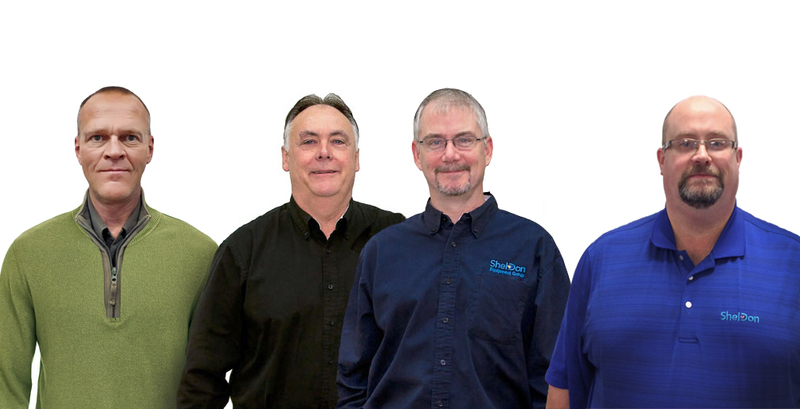 They deliver easy, efficient workflow and connectivity to mobile devices and cloud-based tools. Smooth fleet integration allows transition from single-function printers to advanced MDS solutions without sacrificing space. Designed to help any business reach higher productivity, these models are simply advanced. An exceptionally intuitive, simple-to-use interface puts access to all functions right at your fingertips, whether at the device or at your desktop. Work better together—your teams will have the ability to access and leverage the capabilities of other connected imageRUNNER ADVANCE devices on your network. Even on the go, you're in control. Print from a laptop, tablet, or smartphone to an imageRUNNER ADVANCE system. A touch of a button on the user interface lets you access, scan to, or print directly from certain cloud applications. Multilayered solutions help safeguard confidential information and, with certain options, support security compliance. Advanced technology and expansive enterprise applications work seamlessly with your device to deliver exceptional results. imageRUNNER ADVANCE 6565i The Canon imageRUNNER ADVANCE 6500 Series can be the frontline to your digital business communications, exhibiting enterprise-class performance. This black-and-white multifunction printer can be instrumental in meeting today's demand for integrated imaging, cloud, and mobile solutions. Built on Canon's Third Generation imageRUNNER ADVANCE core values,* the imageRUNNER ADVANCE 6500 Series operates on intelligent information management principles. The imageRUNNER ADVANCE 6565i multifunction printer is designed to meet your most diverse and complex printing and scanning challenges for maximized uptime, intuitive usability, advanced authentication capabilities, amazing speed, and large page volumes. *Canon's Third Generation imageRUNNER ADVANCE core values include Workflow Efficiency, Cost Management, Security, Device and Fleet Management, Quality and Reliability and Sustainability. Designed with your bottom line in mind, the imageRUNNER 1435iF helps minimize costs and maximize reliability, while the robust design helps ensure long, dependable operation. 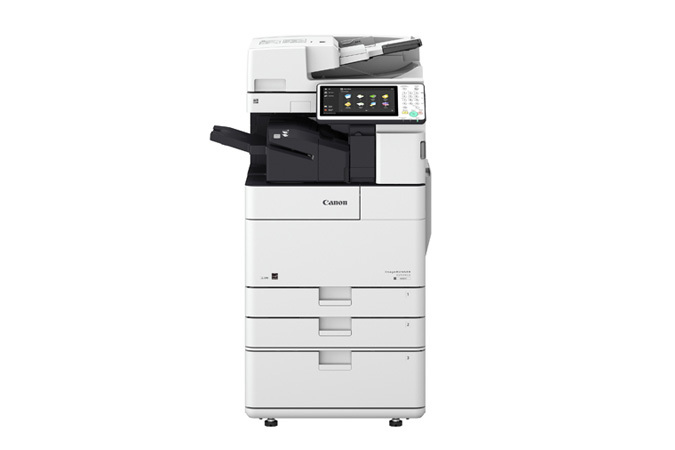 Small enough to fit on a desktop, the imageRUNNER 1435iF can be used by itself or as part of a larger Canon MFP fleet. An ideal replacement for single-function printers or older models, the imageRUNNER 1435iF easily integrates into your network to streamline management and maintenance of your devices. With a first-copy out time as fast as 6.9 seconds and output speeds up to 37ppm, the imageRUNNER 1435iF allows you to accomplish a lot in a small space. 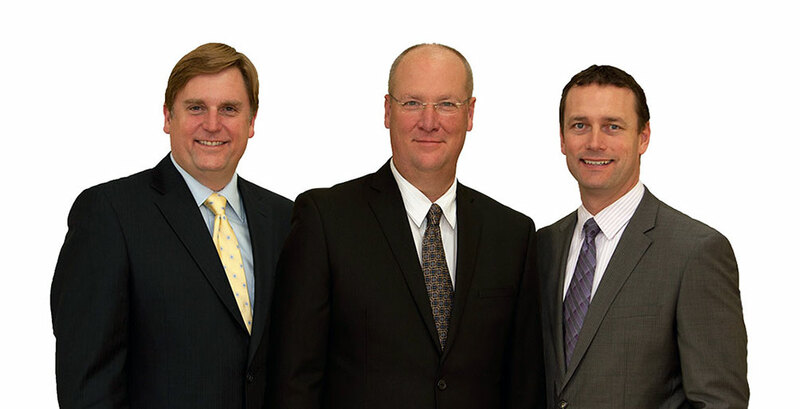 Copy, print, scan, and fax documents in sizes up to 8-1/2" x 14". Maximize resources and boost productivity with the standard 600-sheet capacity that can be increased to handle 1,100 sheets. Ideal for printing business documents, the imageRUNNER 1435iF comes standard with Canon UFR II LT, PCL 5e/6 and Adobe PostScript 3. 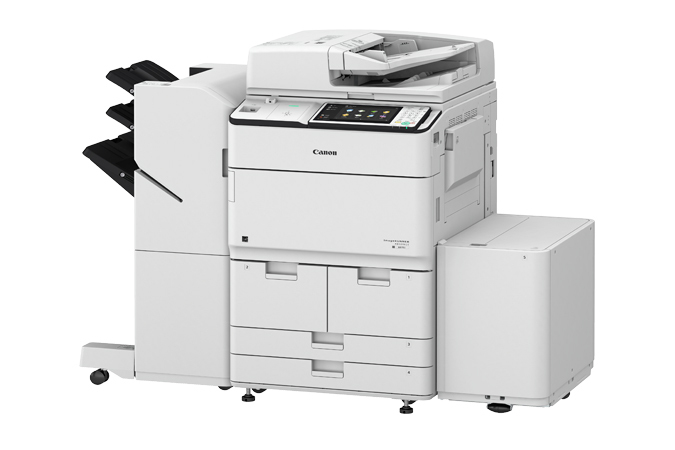 The Canon imageRUNNER ADVANCE 8500 Series is an intuitive, high performance solution for enterprise-level offices and central reprographics departments (CRDs). This black-and-white multifunction printer can be your organization's essential device for streamlining overall workflow efficiency and helping to improve productivity in a high-volume workplace. Built on the core values of Canon's Third Generation imageRUNNER ADVANCE platform,* the imageRUNNER ADVANCE 8500 Series operates on intelligent information management principles. Designed for high volume offices and CRDs, the imageRUNNER ADVANCE 8585i multifunction printer is capable of meeting diverse needs, with high quality output and precision staple/booklet finishing options. Serving high-volume offices and in-plants, the imageRUNNER ADVANCE 8500 Series is designed to not only meet the needs of dedicated operators but it can also serve busy multi-user environments, with an intuitive user interface. Together these benefits can improve uptime and help facilitate business continuity. * Canon's Third Generation imageRUNNER ADVANCE core values include Workflow Efficiency, Cost Management, Security, Device and Fleet Management Efficiency, Quality and Reliability, and Sustainability. 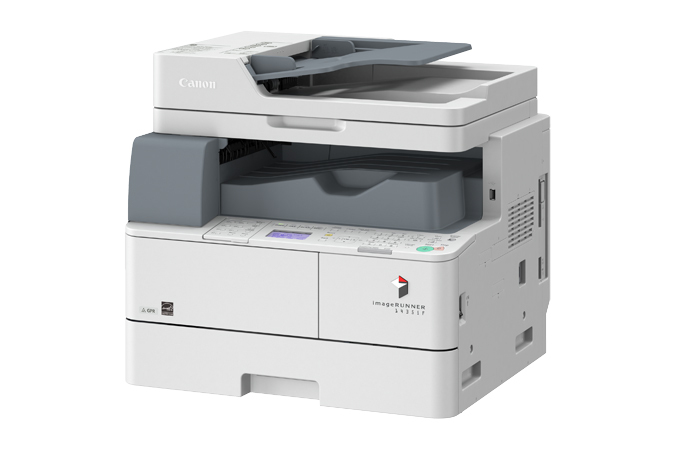 Built to operate as a stand-alone solution or to integrate into a multi-device workplace, the Canon imageRUNNER ADVANCE 4535i all-in-one printer can deliver consistent and reliable performance in a compact, space-saving design. This black and white printer offers an intuitive user experience that can integrate with Canon’s holistic business solutions, meeting the needs of a wide range of offices and departments within large organizations. Built on the imageRUNNER ADVANCE platform, with user-friendly My ADVANCE customization, the imageRUNNER ADVANCE 4535i printer/scanner/copier is a solution for a variety business needs. 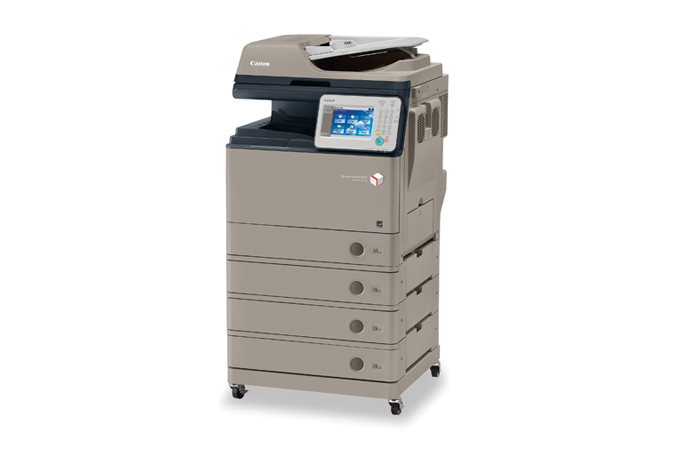 Ideal for small to medium size businesses and cost-conscious workplace environments, the imageRUNNER ADVANCE 4535i model performs with printing speeds of 35 ppm in black and white and the ability to scan up to 160 ipm (300 dpi) in color or black and white through an optional single-pass duplexing document feeder. This multifunction printer offers an intuitive user interface and several optional finishing features, including staple-free stapling, traditional stapling and hole-punching. The imageRUNNER ADVANCE 4535i can give businesses high-quality output while helping to reduce downtime with efficient features and reliable performance. Built for quality, reliability and sustainability, the imageRUNNER ADVANCE 4525i provides busy offices with a multifunction printer designed to improve workflow and perform seamlessly in a variety of environments. This compact, all-in-one printer offers an intuitive user experience, making it an outstanding choice for small to medium sized businesses and departments within large organizations. Ideal for cost-conscious environments, such as schools, government entities and hospitals, users can benefit from the many features of the imageRUNNER ADVANCE 4525i model. 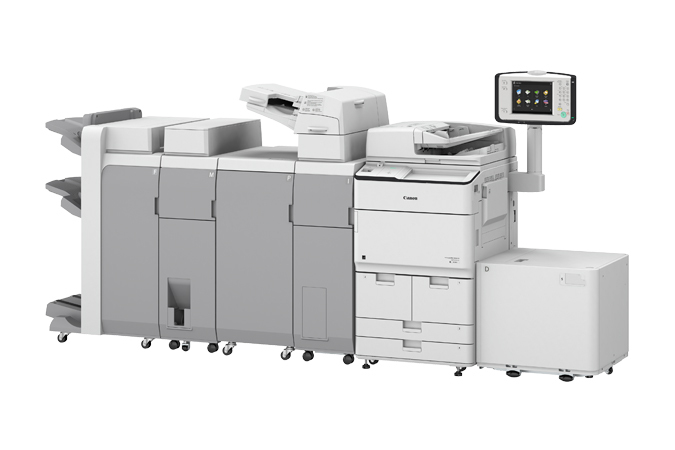 The imageRUNNER ADVANCE 4525i offers printing speeds of 25 ppm in black and white and the ability to scan documents in both B&W and color. The imageRUNNER ADVANCE 4525i has several optional features available, including staple-free stapling, traditional stapling and hole-punching. This high-performing, efficient printer is built upon the intelligent imageRUNNER ADVANCE platform, designed to meet a range of business needs with an easy-to-operate user interface. The Canon imageRUNNER ADVANCE 6500 Series can be the frontline to your digital business communications, exhibiting enterprise-class performance. This black-and-white multifunction printer can be instrumental in meeting today's demand for integrated imaging, cloud, and mobile solutions. Built on Canon's Third Generation imageRUNNER ADVANCE core values,* the imageRUNNER ADVANCE 6500 Series operates on intelligent information management principles. The imageRUNNER ADVANCE 6555i multifunction printer is designed to meet your most diverse and complex printing and scanning challenges for maximized uptime, intuitive usability, advanced authentication capabilities, amazing speed, and large page volumes. *Canon's Third Generation imageRUNNER ADVANCE core values include Workflow Efficiency, Cost Management, Security, Device and Fleet Management, Quality and Reliability and Sustainability.